Manchester United are set to launch a €40million move for the signing of Barcelona’s defender Yerry Fernando Mina. United seems determined on putting everything in place for the new season as they are still busy in the transfer window that will be shutting on August 9. According to reports from RMC, head coach Jose Mourinho is keen on bringing the Columbia international over to the English side. The 23-year old centre-back made a name for himself in the just concluded FIFA World Cup held in Russia as he made a record of most goals scored by a defender in a single World Cup with three goals to achieve this. 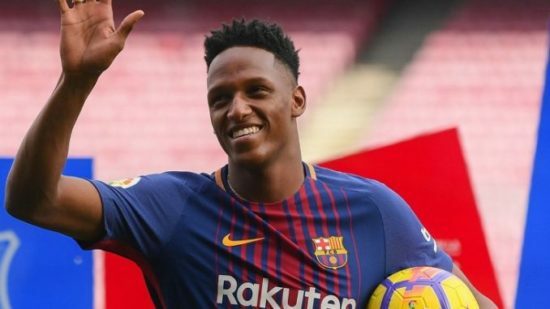 Mina is said to be eager to leave Nou Camp and he was recently linked to a transfer to Everton and Lyon as the club have shown interest in him. Manchester United who recently showed their interest for the player are said to be ready to pay the speculated sum of €40million for the signing of the defender. However, talks about Mina’s future is schedule to hold this week as his Uncle, Jair, who is also his agent, is already in Barcelona for that purpose. It is hoped that a deal pulls through and he gets signed by Manchester United as that will boost their defense power as they hope to claim the first spot in the Premiership this new season after finishing in second place last season.